NEW ORLEANS – Injured running back Pierre Thomas could make his long-anticipated return to active duty Sunday in an important road game against the Cincinnati Bengals, New Orleans Saints Coach Sean Payton said Tuesday night. Payton said Thomas has “turned the corner’’ in his rehabilitation/recovery from a severely sprained left ankle that has sidelined him the past eight games and triggered widespread speculation as to the nature of the injury. Drew Brees, who brought his rebuilt shoulder to a city some thought would never rebuild after Hurricane Katrina and led the New Orleans Saints to a Super Bowl title last season, was selected Sports Illustrated’s Sportsman of the Year on Tuesday. As Sports Illustrated Group Editor Terry McDonell, who personally made the pick, put it, Brees didn’t win because his admirable work is done. Rather, more is to come with Brees, he said. His artistry on the field is inseparable from his work off. All of which, McDonell said with undisguised astonishment, is genuine. Defensive end Will Smith released a statement tonight through the New Orleans Saints regarding his arrest over the weekend in Lafayette, La. “During the past weekend, my wife Racquel and I were visiting her family in Lafayette, Louisiana for the holiday weekend. Early Saturday morning, an unfortunate misunderstanding led to my arrest. “My wife was not injured as reported and this was not a domestic issue. I am confident that the legal process will bear this out. Both Racquel and I look forward to having the legal process play out and will cooperate fully. Until then, and based upon legal counsel, I will not be able to make any further comment on this matter. The New Orleans Saints and the Louisiana Office of Motor Vehicles announced today the sale of a prestige Louisiana license plate commemorating the Saints’ 31-17 victory over the Indianapolis Colts in Super Bowl XLIV. The specially created New Orleans Saints “World Champions” license plates will begin being sold tomorrow at selected Offices of Motor Vehicles. The Saints also announced that formation of a special auction would be held for those interested in purchasing one of the first 98 specially marked license plates. Sports writer Mike Triplett contributed to this story. New Orleans Saints defensive end Will Smith was arrested and charged with domestic abuse battery early Saturday morning after he allegedly grabbed his wife by the hair near a Lafayette nightclub. According to a news release from the Lafayette Police Department, Smith was arrested shortly after 2 a.m. in the 300 block of Jefferson Street after police officers observed him arguing with his wife, Racquel Smith. There was much to glean from the New Orleans Saints’ 30-27 win against the Dallas Cowboys on Thanksgiving Day. The Saints offense is back. The balanced, big-play, quick-strike, score-from-anywhere-on-the-field krewe we’ve grown accustomed to seeing on Sundays finally reappeared, just in time for the holidays. ARLINGTON, Texas — Maybe it was one of the goat horns that suddenly was sprouting out of Malcolm Jenkins‘ helmet that caused perhaps the biggest play of the season for the New Orleans Saints. 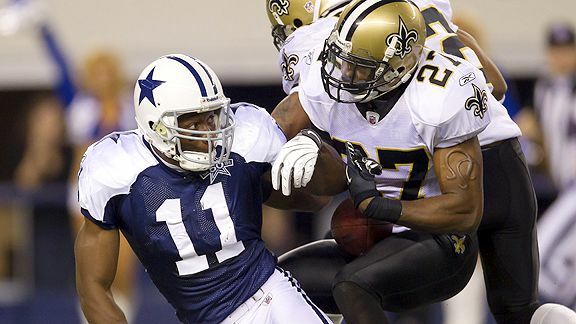 The safety, who made a mistake in coverage, somehow chased down Dallas Cowboys receiver Roy E. Williams and popped the ball loose deep in Saints’ territory. Just moments earlier, it seemed the Saints were about to let a shot at a repeat of the NFC South title and the Super Bowl championship fade away. When safety Malcolm Jenkins entered New Orleans Saints lore by ripping a ball free in the closing minutes and giving his team a chance to win on Thanksgiving Day, New Orleanians rejoiced at a rare and improbable holiday gift. For them, it was something new. For those who have watched Jenkins over the years, however, the forced fumble and recovery against the Dallas Cowboys produced yet another amazed shake of the head. The play seemed familiar to those who watched Jenkins lead Piscataway Township High School to three consecutive New Jersey prep championships, or those who saw him chase a Texas receiver down from behind at Ohio State. Get an official certificate for the Who Dat Nation! Another great item from Michael Hunt, and Hunt Studios. We told you about the Drew Brees poster last week which rocked. Well he has done it again ! 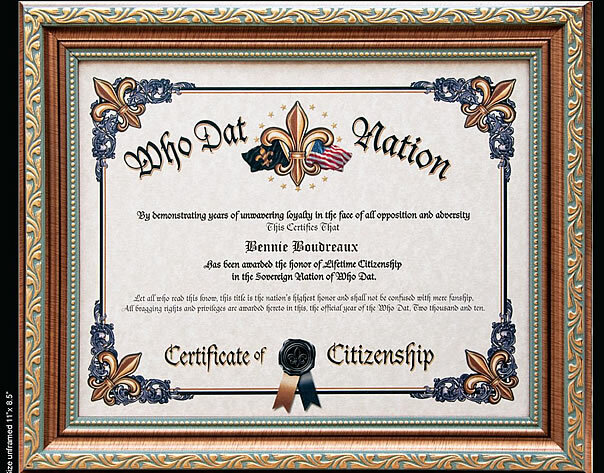 It’s the first official certificate proving you’re a true citizen of the Who Dat Nation! Each certificate comes custom imprinted with any name you like so long as they’re a real Who Dat and not some wannabe! It’s the MUST HAVE gift for every fan this Christmas! Click here now to get your certificate ! Who Dat Nation takes over Dallas ! Posted in Videos!, Who Dat's | Comments Off on Who Dat Nation takes over Dallas !